A decent smoothie bowl. I'd use more almond butter next time, I could barely taste it. My first failure from Chloe Flavor. Not a single waffle came out right. The way they tore, both sides were very crispy and there seemed to be very little holding it together in the middle. It was like a shell of a waffle. I preheated the iron, greased it, checked it for doneness before opening, experimented with different temperatures and different cooking lengths, and every single waffle stuck to the iron and tore right through the middle. The batter uses a lot of baking powder and I could taste it in the end product. Wouldn't bother making these again. The strawberry butter is a great idea! But I think I'll wing it next time. She doesn't say how big or small your strawberries should be, and my strawberry to butter ratio was off. It didn't really come together and it was runny. Also I used Earth Balance and really wished I used Miyoko's. Next time! It was still a super tasty and fun waffle topping. Loved these. The bananas make the pancakes more dense, but the flavor is great. f you are looking for vegan recipes that are FANTASTIC, this is the book. Chloe’s recipes are legit! The successful restaurant owner and celebrated vegan chef makes her highly anticipated return to the cookbook world with 125 original recipes that focus on simplicity in the steps and big flavor in the food. Chloe Coscarelli has been vegan since 2004--a time when veggie burgers were still feared (and maybe disgusted) by the general public. 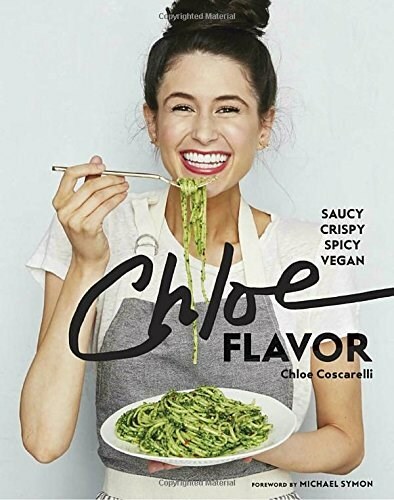 Since then, she has been at the forefront of the vegan revolution: Chloe believes that vegan can still mean mouthwatering foods, and she practices what she preaches. In Chloe Flavor, Chloe showcases new approaches to veganism with dishes like Maple Bacon Benedict, Hawaiian Teriyaki-Pineapple Burger, and Cajun Jambalaya with Scallion Biscuits. These dishes are playful, colorful, and supremely tasty. Best of all, she's made them as fast and as easy as possible because that's exactly how she likes to cook. Vegans will delight in Chloe's creativity--and carnivores won't miss the meat one bit. Chloe's Vegan Desserts: Over 100 Exciting New Recipes for Cookies and Pies, Tarts and Cobblers, Cupcakes and Cakes - and More!